A first-class mystery, thriller and suspense with perfect pacing. 5.0 out of 5 starsA first-class mystery, thriller and suspense with perfect pacing. Bestselling author Uvi Poznansky weaves fantastic murder, mystery and suspense tale with intriguing twists and turns that will easily captivate the reader’s attention from the opening page. The author paints a gripping story of murder, virtual reality and romance in a very vivid and convincing way. In addition, the characters are drawn with great credibility and integrity. 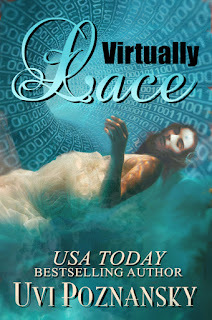 The book description gives a sneak preview: ‘Haunted by discovering the body of Lace, a beautiful dancer whose throat has been slit, Michael sets out to create a virtual reality simulation of her murder. Can he bring the mystery to life? Can he solve its clues in time, before the killer turns on the woman he loves, Ash? Now, if that’s not enough to get your curiosity juices flowing, I don’t know what will. But if you want to find out what happens, you’ll just have to turn the pages for yourself! However, I will say it was well worth the read. I’ve read this author several times and I must say I was very impressed yet again. I enjoyed the story, character development, and dialogue. There were plenty of plot twists that I didn’t see coming and that added to the book's mystique. When I stopped reading to work, I found myself wondering what happened in the book, and replaying parts of the novel in my head to see if I could figure more out. It has been a while since I enjoyed a book this much. It’s a first-class murder mystery with perfect pacing. Not much is as it appears here, which is just the way fans of mystery, thriller and suspense will want it! This was a fascinating and captivating read that had me immersed from the beginning. The story flowed from scene to scene with ease, and as always, the author shows exceptional ability when it comes to storytelling. There are plenty of attention-grabbing moments in this page turner that will take the reader on a truly mesmerizing journey! I’ll be looking forward to reading more from this author in the future. Highly recommended and a well-deserved five stars from me.